The visit is the first by a Saudi king in 46 years, though Salman visited more recently as crown prince. TOKYO: King Salman and hundreds of business leaders from Saudi Arabia are in Japan for talks Monday mainly expected to focus on economic ties. Saudi Arabia is one of Japan's biggest suppliers of crude oil, accounting for about a third of its total imports of oil from the Middle East. The kingdom is striving to diversify its economy away from its heavy reliance on oil exports, and Salman is on a month-long tour of Asia to advance his kingdom's economic and business interests. Japan's Chief Cabinet Secretary Yoshihide Suga told reporters Monday that Japan is willing to provide support for the economic power in the Middle East. He did not confirm reports that the countries would agree to set up a special economic zone in Saudi Arabia. Salman met with Japanese Foreign Minister Fumio Kishida and was to meet Prime Minister Shinzo Abe later Monday. Reports say Japan plans to urge that Saudi Aramco, the state-run oil company that is being partially privatized, seek a share listing on the Tokyo Stock Exchange. Separately, Saudi Arabia's sovereign wealth fund and Japanese telecoms provider and energy company Softbank have joined forces in setting up a $25 billion private fund for technology investments. Trade between the countries fell overall last year as oil prices dropped. Japan's 2.1 trillion yen ($18.6 billion) in imports from Saudi Arabia in 2016, mostly oil and gas, dwarfed its exports of 546.3 billion yen ($4.8 billion). The delegation arrived late Sunday on about 10 aircraft. Officials said top hotels and car hire services would be busy handling the unusually large group during its four-day visit. Salman's stop in Japan follows visits to Indonesia and Malaysia. He is due to travel on to Brunei, China and the Maldives. 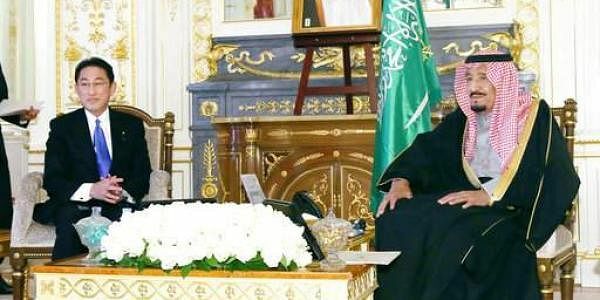 While seeking investment and help with Saudi industrialization and development of its services sector, Salman has also offered help. Earlier, he pledged $1 billion in development finance for Indonesia and closer cooperation for combating transnational crime such as human trafficking, terrorism and the drugs trade.